Could Florida Become the New Fracking Frontier? Disney. The Everglades. Migrating Birds. Tourists. Fracked wells and impoundments were once a far-fetched possibility in Florida, but soon they could be hitting close to home. As industry interest in bringing fracking to the Sunshine State intensifies, environmental groups worry about risks ranging from contaminated groundwater, disruption to some of the county’s most bio-diverse ecosystems and aquifers sucked dry. A state House panel earlier this month OK’d two bills that would require the industry to report chemicals used in fracking. In a partisan 8-4 vote, the two measures passed through the majority Republican House Agriculture and Natural Resources Subcommittee, as state legislators grapple with the potential of Florida becoming the Fracking Frontier. In Collier County – less than 1,000 feet from the Big Cypress drainage basin and in the middle of the Florida panthers’ remaining Everglades habitat – Dan A. Hughes Company has applied for a wastewater injection well permit, according to Florida Department of Environmental Protection documents. The Beeville, Texas-based company is leasing the underground mineral rights from Collier Resources Company, which owns or manages more than 800,000 acres of mineral rights in three counties in Southwest Florida. After a public protest, the Environmental Protection Agency agreed to hold a hearing on the permit on March 11, said Jennifer Rubiello, field associate for Environment Florida. Environmental groups are concerned that if Collier Resources and its partner Dan A. Hughes Company are allowed to drill the wastewater injection well it will set a precedent that will invite more and more oil and gas drillers into the Sunshine State. “This could be a very dangerous precedent for Florida,” Rubiello said. Rubiello added that early indications are pointing to the introduction of acid fracking in Southwest Florida. The process would use water pressure and acid to blast open limestone deep beneath the surface of the earth to release trapped oil and gas. Matthew Schwartz, executive director of South Florida Wildlands Association, an organization that fights to protect the habitat of the endangered Florida Panther, believes fracking could be coming, but he is not sure when. Oil and gas company interest in fracking in Florida has been building quietly and steadily for over a year. As early as 2012, companies applied for early drilling and wastewater permits and had conversations with state environmental officials about the possibility. David Mica, executive director of the Florida Petroleum Association, says research has shown that fracking could force up oil and gas that’s trapped thousands of feet below the surface in Florida’s compressed limestone formations. “Where hydraulic fracturing has been most successful has been in shale-type structures,” Mica said. “It is now thought that it can work in other formations.” Those formations, Mica said, include Florida’s limestone 10,000 feet, or deeper, below the surface. Proponents such as Mica say fracking would help provide energy in a state that gets about 60 percent of its overall electricity from natural gas. They also point to historic conventional oil and gas drilling in the state, and improvements in pipe casing and other technology used in hydraulic fracturing. 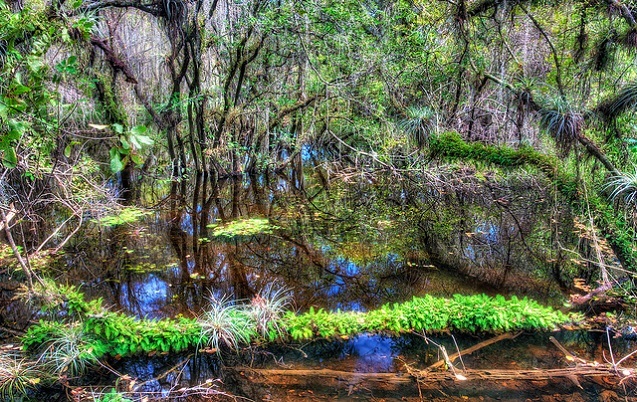 Critics warn that in addition to water woes, the controversial process could disrupt bio-diverse areas within and bordering public lands such as Florida Panther National Wildlife Refuge and Big Cypress National Preserve – thus proving harmful to endangered species such as the Florida panther, of which an estimated 100 to 160 remain in the wild. The 800,000 acres of mineral rights owned by Collier Resources Company in Collier, Lee and Hendry counties sits beneath much of the wilderness that is the panther’s remaining habitat. The South Florida Wildlands Association filed a lawsuit against a proposed oil well within one mile of Florida Panther Wildlife Refuge. The well South Florida Wildlands is opposing, along with two other wells Collier Resources Company wants to drill, would use traditional horizontal drilling technology. From one well, “they can go out like an octopus in eight directions,” Schwartz said. “What we know for sure is that the current rash of applications for horizontal drilling and seismic testing will be impacting and degrading the last remaining habitat for the Florida panther,” Schwartz said. When it comes to fracking in Florida, the industry’s attention appears to be focused on two parts of the state. The first is the “Sunniland Trend,” the underground formation that runs directly below public lands such as Florida Panther National Wildlife Refuge. The trend is 150 miles long and 20 miles wide, stretching from Fort Myers in Southwest Florida to Miami. Media reports as early as October, 2012 in the Fort Myers News Press detailed initial interest by companies in fracking in the deep, unexplored regions of the Sunniland Trend. The second area of fracking focus is Northwest Florida. But that doesn’t mean the gas and oil companies aren’t looking in other regions, too. “A lot of the activity has to remain confidential because the stakes are so high,” Mica said of the race to bring hydraulic fracturing to a new frontier. “Public attention is on those two areas in Southwest Florida and Northwest Florida.” Also unknown is whether it will be economically feasible to frack in Florida, where the geology is so different from natural-gas rich areas such as the Marcellus Shale in Pennsylvania, Ohio and West Virginia. Yon, the legislative director at Audubon Florida, says water used in the fracking process in Lee or Collier counties could have a big impact on the water supply. “One of the first and foremost concerns would be the amount of water used to carry out this process,” Yon said. Even fracking to the south in Lee, Collier and Hendry counties could have implications in nearby counties such as Sarasota, said Jon Thaxton, conservationist and former Sarasota County commissioner. Thaxton has concerns. One of those concerns is the potential stresses on the aquifer and rivers and lake, and potential for contamination, in a state where “a delicate balance” keeps water healthy and viable as a source of drinking water. Audubon Florida, along with environmentalists, contend that the proposed two house bills (House Bill 71 and House Bill 157) don’t do a good job establishing environmental standards and holding the oil and gas companies accountable if they frack in Florida. Critics argue the measures, through the appearance of disclosure, provide the oil and gas companies cover to start using the process in Florida. The first bill, HB 71, would require companies to inform the state Department of Environmental Protection (DEP) of the chemicals they use in the process and for the state agency to forward the information to a national registry called FracFocus.org. The second bill, HB 157, would allow the Florida DEP to determine if an exemption from public disclosure should be given to any chemical that a company argues needs to be shielded as a “trade secret.” Both bills are sponsored by Ray Rodrigues, R-Estero. There are two problems with the bills, Yon said. The first problem is neither measure requires companies to disclose the amount or concentration of chemicals used. “There is no mention of the concentration of these chemicals,” Yon said. Audubon Florida also “has a level of discomfort” with the use of FracFocus.org, which was created using industry funding. The major red flag for Yon is the “trade secrets” provision that would provide a path for the industry to try to disguise the use of certain chemicals or compounds that could be toxic individually or in combination with other chemicals. Roger Drouin is a freelance environmental journalist. His recent articles have appeared in Grist, Yale Environment 360, Mother Jones and The Atlantic. Some of his nature photography and environmental writing can be found at www.rogersoutdoorblog.com.